Choosing the right fittings to complement the rest of the bathroom is not always an easy task, with many clients changing their minds at the last minute. This clever in-wall solution allows for easy installation, with the added bonus of being able to select mixers and thermostats even after the tiles have been installed, writes Dimi Kyriakou. Watch any of the home renovation shows on TV and it’s clear that the bathroom is one of the main focal points of the home. It’s a place where style and functionality reign – but it’s not always the easiest room to put together, regardless of whether it’s a new build or a renovation. Aesthetically appealing and well-functioning bathrooms are a high priority both to builders and to their customers. For that reason, the design process can take some time, and choosing the right finishes can take longer than anticipated (whether that’s the result of an indecisive customer or unforseen problems that come up on-site). 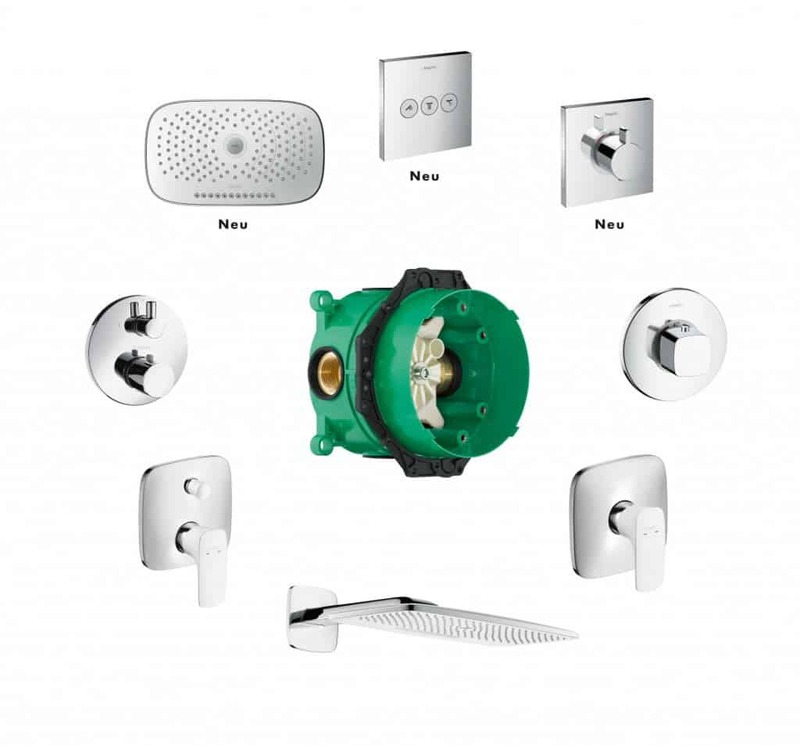 For the last 13 years, German tapware and shower manufacturer Hansgrohe has made the lives of builders and plumbers much easier with the ongoing success of the iBox Universal, a versatile in-wall application that fits over 200 styles of Hansgrohe and Axor shower mixers, thermostats and diverter mixers. Now, it will continue to be of benefit as the company rolls out its new ShowerSelect finish sets in Australia next year. According to Hansgrohe Oceania marketing and communications manager Natasha Rivett, the iBox Universal is easy to work with, and can allow for flush-mount installation. The iBox Universal was the result of many years of research and development, to design and manufacture an installation unit for the bathroom that could allow a plumber to install any type of ‘water dream’, without the need to turn the entire bathroom into a construction site every time it needed to be updated. “The iBox Universal saves both money and time. It was developed with plumbers, for plumbers, both for ease of installation and once installed, the ability to change over finish sets without having to pull tiling off the wall,” Natasha explains. “This means the plumber’s time on-site (and costs involved) are significantly reduced. Building progress is also not held up at any stage waiting for plumbing parts or decisions, by the end consumer or designer, as the in-wall and construction phase continues past the tiling stage before any decision on design and finish sets needs to be made. She goes on to say that the in-wall unit and the functional unit can be purchased and installed independently of each other. Because the finish set is only delivered in time for the final installation, the risk of theft or damage to functional components while structural building work is carried out is eliminated, as is costly storage. The product also has flexible mounting options within the frame or wall and can be mounted directly onto brick in the case of single and double brick renovations. It has 360° rotational symmetry which means all connections remain the same – cold water on the right, and hot water on the opposite side. “Ease of installation is one of the key features of iBox Universal – as it’s rotationally symmetrical, you can’t install it upside down. When tiling features change at the last minute, for instance from 4mm tile to 10mm marble, there’s a quick fix for in-wall mountings that are too deep or too shallow,” Natasha says. 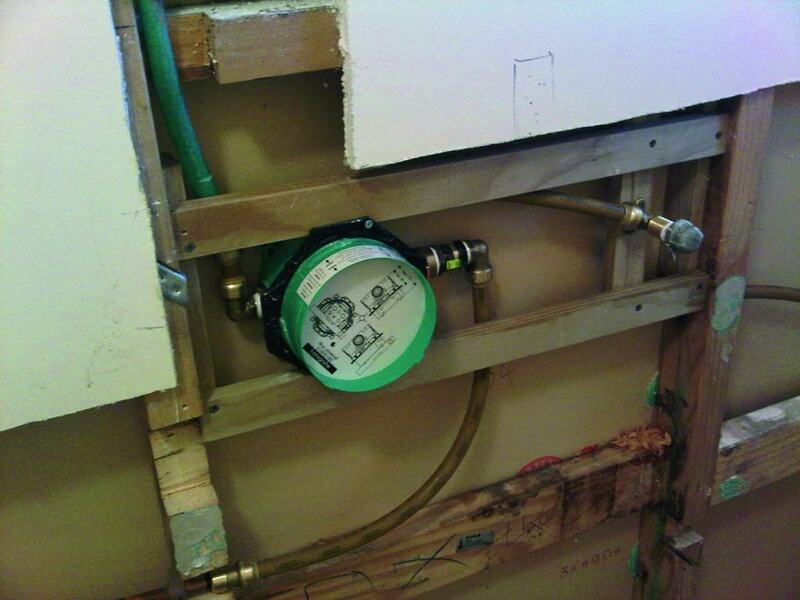 “Plumbers are given some buffer space with installation so they can’t install the product incorrectly. If they put it in the wall too deep, Hansgrohe has developed a basic unit extension that packs it out a bit further. Similarly, if they mount it too proud in the wall, there is a trouble dome available which extends the finish set out. This helps to avoid costly wall reconstruction. An added benefit is that the flushing unit supplied as part of the assembly allows pipes to be flushed quickly and easily. When water starts to flow behind the wall, the brass body of the unit is suspended on sealing joints which means that components that are in contact with water are acoustically decoupled from the brickwork/stud wall. The mounting face plate screws onto the iBox Universal casing rather than the functional block, which prevents sound from being transferred through the tiling. “iBox Universal is also water tight, so water can be turned back on at site after installation. It is also leak proof so any leakage that may occur only happens through the dedicated channel in front of the tiles. This avoids costly fixes under the builder’s guarantee. Hansgrohe also offers a 15 year warranty on all Hansgrohe and Axor products and 25 years on iBox Universal,” Natasha explains. The company also launched a testing campaign in 2009 where 72% of plumbers interviewed about the product said they were “very satisfied”. The diversity of applications and number of ways of installing the unit were also highlighted. “We like to think of the iBox Universal as ‘the brains behind the beauty’… or a universal remote for bathrooms,” Natasha adds. For technical advice and assistance, call the Hansgrohe help line for free on 1800 001 901.